Character - Scoundrel - Pilot. Points: 12/15. Health: 11. 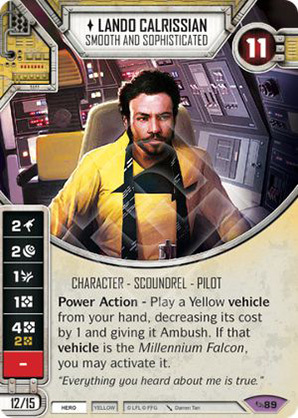 Power Action - Play a Yellow vehicle from your hand, decreasing its cost by 1 and giving it Ambush. If that vehicle is the Millennium Falcon, you may activate it. "Everything you heard about me is true."